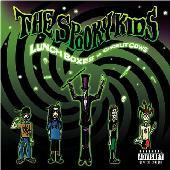 Before Marilyn Manson became ... well, Marilyn Manson ... he was in this band, called The Spooky Kids. After years of legal wrangling and some serious remastering, The Spooky Kids' "Lunch Boxes & Choklit is finally available for mass consumption. My first reaction on spinning "Lunch Boxes..." was one of uncertainty. The songs had potential, but the execution was just not there for me. As you might expect of Manson and those of his ilk, the music here is way south of center, which is a good thing in my book. However, in this instance I just didn't buy what they were selling. The music was way to busy for me to keep my attention. There are high points on the CD, and one can hear glimpses of what Manson would do in the future. Overall, however, "Lunch Boxes" is a mostly only a curiosity. By the way, this CD also comes with a special edition DVD featuring early performances by the band. Our review copy didn't include, so all we can say is, hey, the DVD comes free with the CD. How bad can it be? The Spooky Kids is: Marilyn Manson on vocals; Daisy Berkowitz on guitars, Gidget Gein on bass, Madonna Wayne Gacy on keyboards and Sara Lee Lucas on drums. Revised: 29 Jan 2019 02:25:10 -0500 .